With the largest EV gathering in Saskatchewan history the Saskatoon, Saskatchewan this event was informative and offered significant value to the residents of Saskatoon. We had 10 electric vehicles and a zero motorcycle electric bike on site for viewing and exploration. We had approximately 175 people drawn the site hosted by local sponsors, Peavey Mart! The City of Saskatoon Mayor, Don Atchinson along with 23 others who attended signed up for rides and experienced the different makes and models. For all attendees, the giveaways and conversations were appreciated! 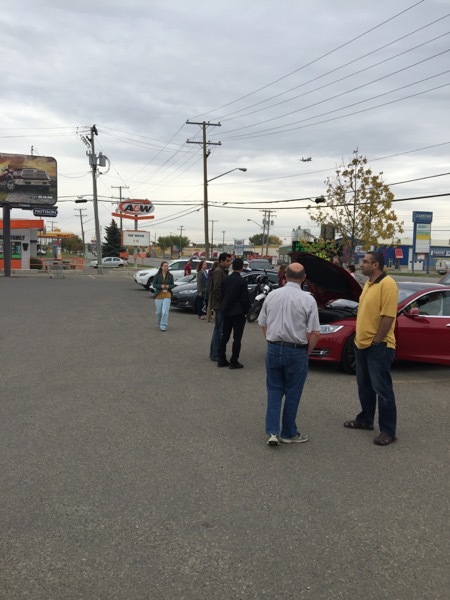 The people of Saskatoon learned more about the advantages of driving electric cars with the help of the drivers and event representatives! It was a really great event:)! All Saskatoon and area electric and plug-in electric vehicle owners are called to join the largest gathering of EVs in Saskatchewan history! This is the 2nd annual event will be held at the local Peavey Mart! Last year, our registered attendees reported 69,910 electric miles driven. We had 3 Tesla Model S, 1 Nissan Leaf, 2 Chevy Volts, a fully electric 40ft city bus-manufactured by BYD and a 1973 fully electric conversion-volkswagen beetle were in attendance! Event Sponsors, electric vehicle (EV) charging infrastructure retailers, EV fleet representatives, Saskatoon local environmental and electric vehicle advocacy organizations will be set up and ready to answer all of your questions! 12- 5pm EV Owners : Check in to get your EV Owner badge and show off your ride. Exhibitors and EV owners should be available throughout the entire event. 12:30 pm – Official EV Count It won’t be an official record, but it will surely be one for the books! Let’s show everyone how Saskatoon does EV! 1:00 pm- 2:00 pm- Celebrity Showing + Media Coverage Celebrities and crew will be on site to profile the event, talk to owners, and explore the world of EVs. Prizes and Giveaways All afternoon we'll be helping our Exhibitors raffle off awesome prizes and giveaways -- just for showing up and chatting with exhibitors and EV owners! Additional activities throughout the event will include hands on displays for all ages to learn more about EVs and charging options, along with entertainment, snacks, and giveaways. Registered attendees report 290,609 electric miles driven.